There is no stopping us. Let us continue until each and every domestic worker is valued and all of us are free. In this document we set out why domestic workers, our workplace, and clear definitions of who we need protecting from are among the issues that must be specifically included for this new Standard to be effective and bring about significant and lasting change for the better. Only then might domestic workers and indeed other marginalised workers be optimistic that we can provide our highly valuable services in the safe and secure conditions that we deserve and are entitled to. This revised manual will teach the basic steps for using the communication network for registered members and non-members. This manual will inspire domestic workers, their organizations, and their supporters to build strong organizations of domestic workers. As it is only through organizing and collective action in the labour, economic and social spheres that domestic workers will obtain respect and the rights afforded to other workers to decent jobs that earn a decent living, and to access labour and social protection throughout their lives. The eight good practices demonstrate successful initiatives to combat child labour in India and Nepal; to establish strong and sustainable domestic workers organizations in the form of trade unions, cooperatives or associations in Indonesia, the Philippines and the Republic of Korea; on skills development and organizing in Hong Kong, China, and on the global online IDWF communication network. IDWF Annual Report 2016 - UNITED, WE GROW STRONGER! 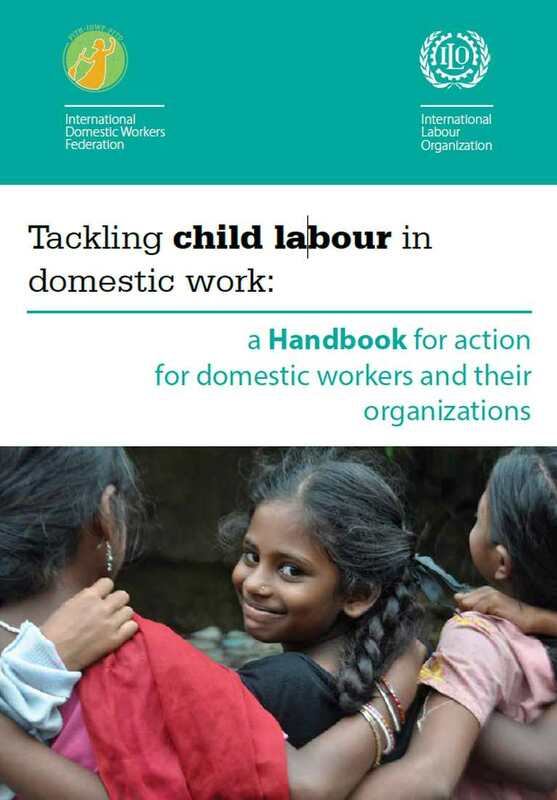 The handbook will inspire domestic workers and their organizations to eliminate exploitative, harmful and hazardous child domestic work, promote decent work for domestic workers, and help domestic workers to reach their full potential in work and in life. IDWF Annual Report 2015 - Build, Organise, Organise! This report documents the results of the virtual community of practice hosted on the website of the International Domestic Workers Federation (IDWF) in August and September 2015, with the support of the International Labour Organization's Global Action Programme on Migrant Domestic Workers and their Families (GAP-MDW). The community of practice, which took the form of an e-discussion, aimed to collect the organising experiences of domestic workers' organisations and to provide a forum for the exchange of good practices between the organisations. The experiences collected will feed into a Global Flagship Report on migrant domestic workers currently being prepared by GAP-MDW. The International Domestic Workers Federation (IDWF) communication network (idwfed.org) was created in 2014, with the help of the International Labor Organization’s PROMOTE, Olaf Palme Centre and FLOW. The goal of the network is to unite domestic workers globally and create a place for them to share updates, news, activities, and resources. The network is also a source of information on domestic workers. Any interested person can join the network, though only affiliate organizations are given their own pages on the website. The leaflet tells about IDWF: who we are, our history, what we do, how we work and our leadership. Based on the research of Hu Dawu, Professor at the Southwest University of Political Science and Law published in December 2013. November 25 is the UN’s International Day for the Elimination of Violence against women. To acknowledge the event, the IDWF asked its community to discuss the prevalence of violence in domestic work and how IDWF can work to solve it. We the members of the International Domestic Workers Federation (IDWF) commit ourselves to unite into a powerful force to overcome the exploitation and abuse experienced by domestic/household workers across the World. By domestic/household worker we mean any person engaged in domestic/household work within an employment relationship. The International Domestic Workers Federation (IDWF), in cooperation with the Hong Kong Confederation of Trade Unions (HKCTU) and the International Labour Organization (ILO) organized a visioning event for its members in Hong Kong SAR. These included domestic workers and organizers from Bangladesh, Cambodia, China, Hong Kong, India, Indonesia, Nepal, Pakistan, the Philippines, Sri Lanka, South Africa, South Korea, Tanzania, and Thailand. The visioning event was organized under the ILO PROMOTE Project ‘Strengthening domestic workers organizations to end child domestic work’ which is supported by the US Department of Labor (DOL). Presentation of the world IDWF works in from population, income.